For centuries, the story of the Atlantic slave trade has been filtered through the eyes and records of white Europeans. In this watershed book, historian Anne C. Bailey focuses on memories of the trade from the African perspective. African chiefs and other elders in an area of southeastern Ghana-once famously called “the Old Slave Coast“-share stories that reveal that Africans were traders as well as victims of the trade. "A remarkable effort to present the slave trade from a perspective very different from what we are used to, not that of slavery's liberal opponents or even of the slaves themselves but of the Africans from whose midst the slaves were taken . . . Bailey is scrupulously objective in making her way through the resulting political minefield . . . People like Anne Bailey make us uncomfortable, which is all to the good. " "A true work of retrieval and restoration . . . A remarkable gift." "Bailey offers a noteworthy, carefully researched contribution to the study of the African slave trade . . . [and] brings unheard historical voices to the fore." "Bailey is not afraid to ask difficult questions . . . [She] expands and troubles our understanding of the African diaspora. 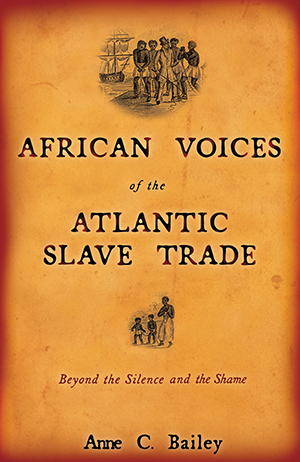 In this fine and accessible study of the slave trade, Bailey places African voices of this era at the center of the writing of history." "[Bailey's] research is important, her questions provocative, and her arguments sensible." "Anne Bailey's judicious, beautifully written account of this extended, appalling human experience is enormously enhanced by her great original contribution-the frequently moving and always thought-provoking memories and understandings of that tragedy amongst the descendants of those who participated as victims and perpetrators in West Africa itself."